Like there was ever any doubt. The Knicks limped into last night’s showdown in South Beach on a three-game losing streak and left in tatters after getting a 108-82 beatdown. As usual, we got to see what a competent team looks like vs. the mess we’ve been putting on the floor for most of the season. Here’s how the massacre went down. 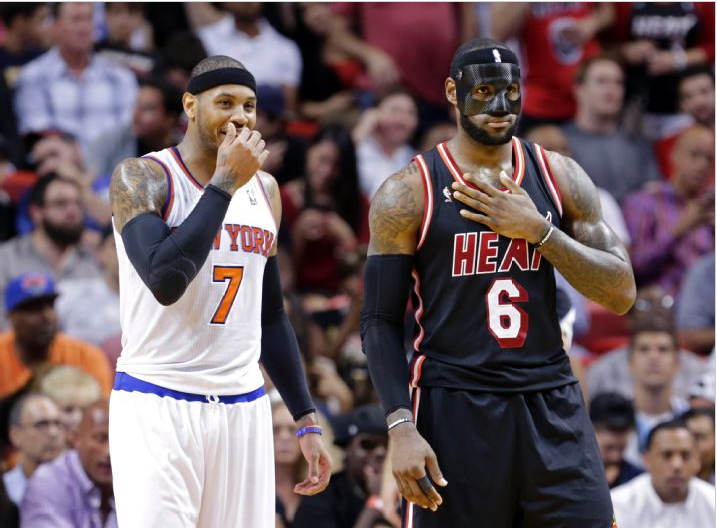 TEAM GREATNESS: Melo upheld his end going toe to toe with Lebron. Melo scored 29 points (55% shooting) and nabbed 7 rebounds. He kept the Knicks in it after a shaky first quarter, and helped ignite the second and third quarters runs that pulled New York within single digits. In addition, our leader put LeBron on a poster via a two-handed stuff at the rim. Masked Lebron wasn’t shabby either, dropping 31 points (68% shooting) along with 4 rebounds and 4 assists. So why was the disparity so great on the score despite the two biggest stars competing on even terms? It’s the fact LeBron has an excellent team around him to pick up the slack. When Melo goes out the game, the team goes into freefall. When Bron sits, he has the luxury of his fellow All-Stars in either Dwyane Wade or Chris Bosh stepping up. Last night it was Wade, who scored 23 points and helped push the lead to double digits in both halfs. The Heat team defense was also surperb with multiple players guarding Melo for different looks and forcing the rest of the Knicks team to try to make plays. Melo had 24 points at the half (nearly have of the Knicks points). The starting Heat backcourt of Wade and Chalmers finished with 34 points on 71% shooting. Meanwhile, the Knicks tandem of Rayond Felton and Pablo Prigioni finished with 2 POINTS ON 10% SHOOTING. Add to JR Smith trying to guard LeBron (and losing him multiple times in transition for dunk just seconds after the Knicks scored), and you had a recipe for a bad defeat. WADE ABUSES THJ: It’s no secret that Hardaway Jr.’s biggest weakness is his defense. Last night, he fell for every Wade pumpfake and move you can think of. To make it worse, we didn’t get his usual offense to offset the schooling, as Tim managed just 6 points on 2-15 shooting. BLACK HOLE OF DEFENSE: We don’t have many lineup choices, but one that must never be seen again is any that includes Amar’e Stoudemire and Hardaway together. Combined, the two were a horrific -64 in the +/- department with the score quickly running back up to the double digits whenever they shared the floor. The Knicks have little time to lick their wounds, as they’ll host the Golden State Warriors tonight at MSG.